Are you ready for 7 top water-coloring tips? You’ll feel like a pro when you practice these tricks! Make sure your Aqua Painter brush is full before you start–you do NOT want to run out of water in the reservoir right in the middle of your project! If you are using a regular brush, keep a little dish of clean water right next to your station. Be aware that water-coloring can bleed through to the back, so protect your work surface. I use a non-porous granite floor tile that doubles as a palette, because I can squeeze my inks right onto it and wipe the residue right off afterward. Have a paper towel or baby wipe handy to blot off excess drips, and to clean the tip of your brush regularly so you don’t muddy colors. Dampen your watercolor paper first so the color slides instead of saturates. Work in small-ish sections, and re-dampen new areas if they’ve dried before you moved on. Keep that Aqua Painter moving. Don’t rest the tip in any one location too long. Straight re-inker is going to be VERY dark, so squeeze the Aqua Painter gently every time you pick up fresh ink, to dilute it with water. Remember that you can always add more color later–but you can’t easily take it off once it’s on, so paint in layers, revisiting areas to add deeper shades later. Keep in mind that it’s only paper! Not cheap paper, no, but it’s still JUST paper. Allow yourself a sheet to practice on and test colors on. 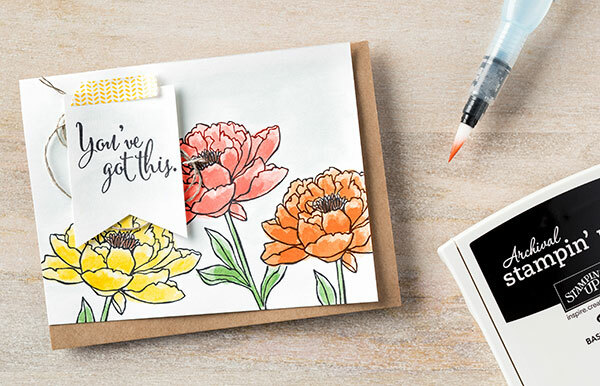 Hope you feel inspired to pull out your watercoloring tools and give it a try. When you do … feel free to share your work with me. You can send them to … lindaluvs2stamp@aol.com and I will post it on my blog at a later date. Please use Stampin’ Up! stampes and supplies.